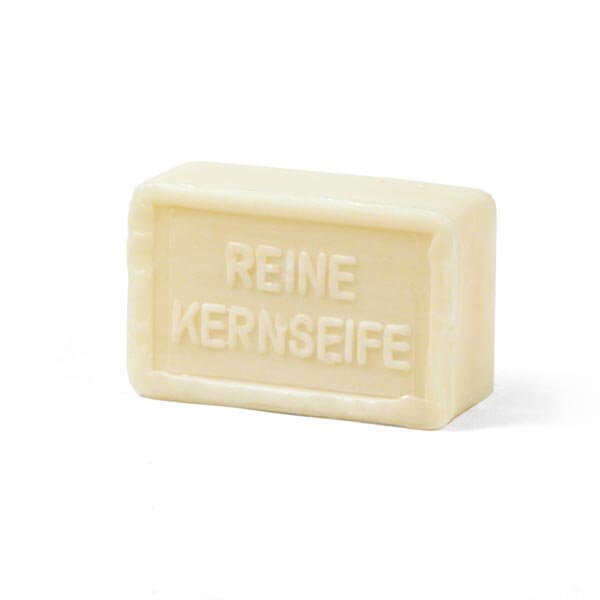 Pure Curd Soap (Reine Kernseife) is a simple, hardworking and long lasting soap is made from pure tallow and coconut oil—70% of the soap composition. Coconut oil contributes cleaning power even in cold and hard water, while tallow gives the soap hardness, which prevents it from softening quickly when wet, making a longer lasting soap. Before being put on sale, it is thoroughly matured to increase its durability. This is an ideal soap for cleaning artists brushes and has been favored among European painters for hundreds of years. The soap gives a slight alkaline reaction in water and will not create much lather, but cleanses well. Curd soaps are hardworking cleansers. Curd soaps are not 'superfatted' and, in contrast to cold-stirred soaps, do not contain glycerin. It does not contain lanolin, oils, emollients, which are added to other soaps to make them gentler and more pleasing for washing the body. Our curd soap is made without these additives, so it performs better when cleaning brushes. Other soaps are made by boiling fatty oils and fats with alkaline solutions so that the result is a mixture of soap with water, excess alkali and glycerin liberated from the oil. In curd soap, on the other hand, the uncombined alkali and glycerin are separated by "salting out," and the soap contains less than 20–25% water. The difference is in the preparation; our curd soap is made according to the method used for several hundred years by European soap makers. Curd soap is prepared by heating purified vegetable oil or animal fat with sodium hydroxide and water. Upon boiling, common salt (sodium chloride) is added to the liquid, so the soap separates as a curd. This was the origin of the term "curd soap" (German: Kernseife). Sodium tallowate (animal fat), aqua (water), sodium cocoate (coconut fat), sodium chloride (salt), perfume, tetrasodium EDTA (chelating agent), sodium hydroxide (alkali), disodium distyrylbiphenyl disulfonate (brightener), citronellol (essential oil—naturally ocurring scent ingredient derived from plants), geraniol (essential oil—naturally occurring scent ingredient found in rose oil and citronella oi), limonene (essential oil—naturally ocurring solvent derived from citrus peels), titanium doixide—Colour Index 77891 (pigment). Water-soluble Paints: Rinse with water, then wash with warm water and curd soap. Acrylic Paints: Keep the hair of the brushes in water to keep colors wet. If acrylic paint is allowed to dry in the tuft, the brush will be ruined. Rinse with water, then wash with warm water and curd soap while still wet. If the acrylic paint dries in the hair, use a special detergent for that purpose. Oil Paints: First, wipe off the excess paint from the brush with a rag or paper towel. Wash remaining color out of the brush hair or bristle with warm water and curd soap. After cleaning, always bring the hair back to the original brush shape. Reshape the tuft with the fingertips and allow to dry standing in an upright position. Before using the brush again, let it dry completely.